Yeah, you probably want none of that. A town that had experienced 100 years of safety from the Titans comes under attack in this first episode. The opening installment was largely a journey through the town to discover just how complacent everyone was against an attack from the Titans. Eren, however, wants to be free from the city walls even as Mikasa constantly sides with his mother and stops him. They even get involved in a fight and stop Armin from being beaten up. However, lo and behold, the Titans attack the town and one ends up eating Eren’s mother as he can only sit back and watch while being carried in the arms of a man he called drunk a few hours earlier. Probably more than any other series going into this season, this was the one that was projected to be good. Not popular like Oreimo, but just good. So let’s start with the story on this one. In a nutshell, this is a pretty standard story about a kid who wants to see more of the world, but is constrained by the society around him. The outside world being dangerous is just the same as not walking into the tall grass on Route 1. There was one especially touching moment you rarely see from any fiction of this type. The losing soldiers coming home. It wasn’t just the look of defeat on the people who ran away from battle, it was also the fact that they knew that they had completely thrown their lives away at trying to fight an enemy far too powerful for them. Such was their emphatic defeat that even they couldn’t lie to the mother of a deceased soldier and tell them they did anything worthwhile. If anything, that scene alone validated this episode. I guess a lot of where this show goes depends on how the characters develop. From my perspective Eren just seemed excessively whiny and weak. 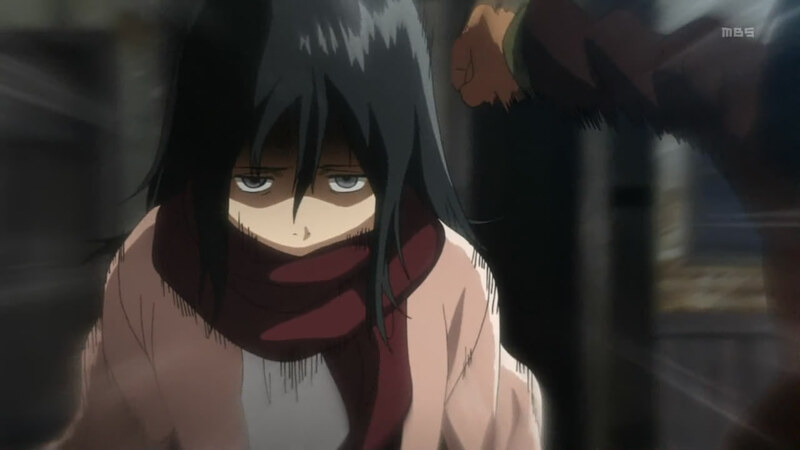 Mikasa, on the other hand, seemed like a strong female character that should be commonplace by now, but she didn’t really talk all that much. I’m expecting some sort of role reversal between the two of them. As for the character of Armin, it felt like he was just voicing what the audience was thinking just a bit too well. Of all the things this show has going for it, we don’t need a Basil Exposition character. As for production quality, Production I.G. have put all they have into this to make it into a high quality adaptation of a highly praised manga. The musical direction was pretty much par from where I was watching. So overall, I can’t really complain too much about the effort that went into the production. Reasons to Drop: Has a very pretentious quality to it and Eren seems too weak to start with. My Verdict: While not my favorite episode from this first week of the season, it has more potential than anything else. I will be continuing this one. As a bit of a fan of the manga, I was happy with what was covered in this episode. And the opening sequence with the Recon Corps attacking the titan showed me that people producing this series were dedicated to making this show look and feel good without cutting corners, at least for now. I almost want to say they were showing off with that opening sequence. Anything else I say I fear would be venturing into spoilers, even if I’m just trying to encourage continued watching of this. I’ll just say that I hope you have fun with where the story starts going. I guess I probably went in with too high a level of expectations for this first episode. It did its job from a fan of the manga’s perspective. I could also recognize it was good even if it wasn’t the most entertaining thing I saw.